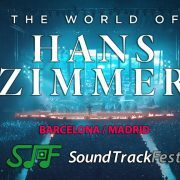 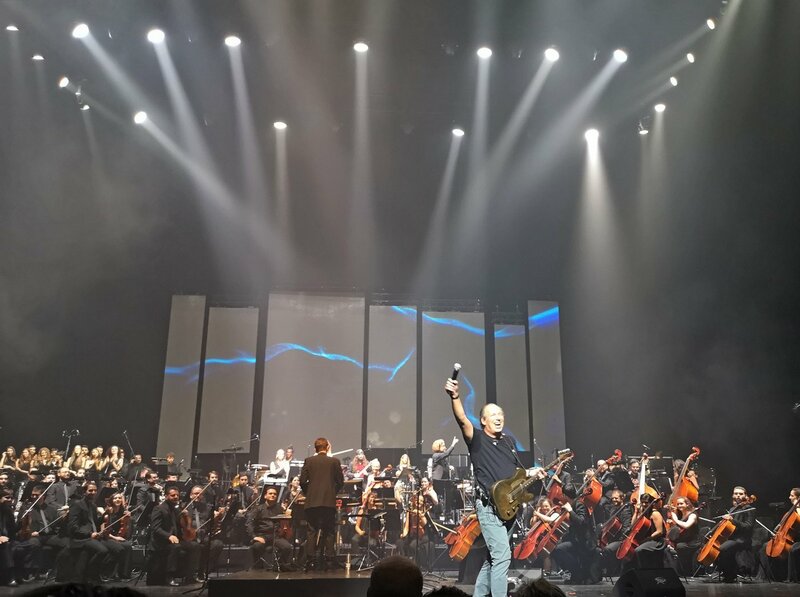 Here you have the article written by Gorka Oteiza for SoundTrackFest, about the concert that the tour ‘The World of Hans Zimmer – A Symphonic Celebration’ celebrated last July 3rd, 2018, at the Teatro Real in Madrid (Spain), where you can see how the show is, in case you plan to attend any of the concerts this year (something that we strongly recommend). 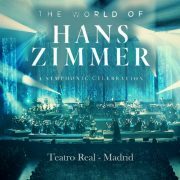 In mid-April 2018, and by surprise, the Teatro Real in Madrid (Spain) announced that the tour ‘The World of Hans Zimmer – A Symphonic Celebration’ that initially had no plans to be in Spain, was going to make a special stop in Madrid on July 3rd, 2018, thus inaugurating the Universal Music Festival concert series organized by the Teatro Real from July 3 to 31, 2018, on the occasion of its 200th anniversary (read news). 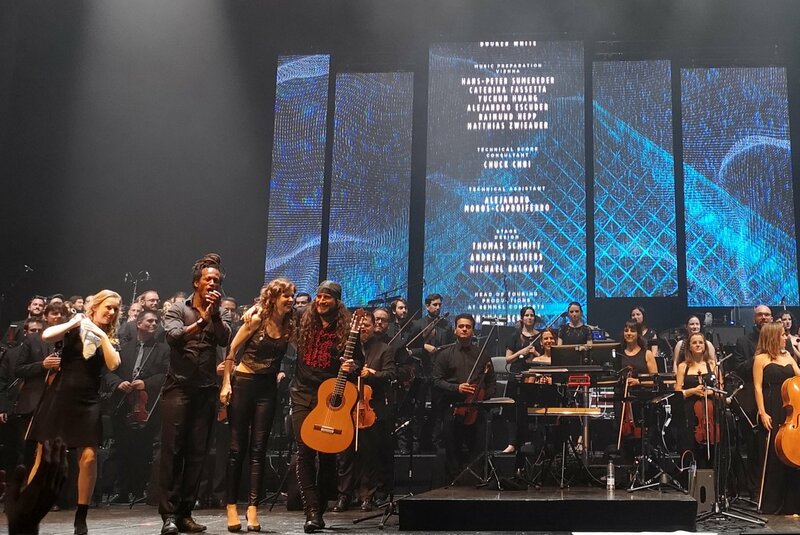 This tour, for which almost all the concerts held have been of a large format, in large venues with more than 10,000 seats and equipped for huge audiovisual shows, was going to have the opportunity to be taken to a different place, a concert hall with less than 2,000 seats. 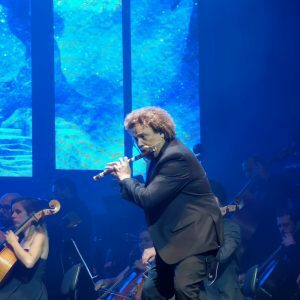 For this reason, and due to the great expectation generated by the event, the only one in Spain of the entire tour in 2018, the tickets sold out in a very short time. 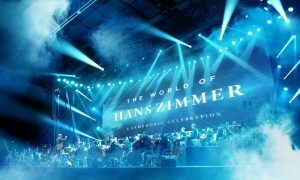 Let’s start this article by clarifying what is “The World of Hans Zimmer – A Symphonic Celebration” and what it is not, since there has been confusion in multiple places about it. 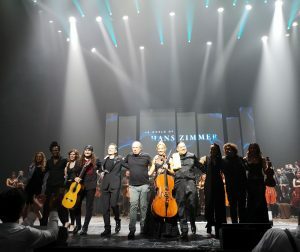 In contrast to the renowned ‘Hans Zimmer Live’ o ‘Hans Zimmer Revealed’ tours that were celebrated during 2016-2017 (read more), where the show was focused on Zimmer’s band and the electronic sounds of the music, ‘The World of Hans Zimmer – A Symphonic Celebration’ presents the composer’s works arranged for a live symphony orchestra for the very first time. Hans Zimmer is the musical director and creator/curator of this show, and has spent months working on transforming his soundtracks into these specially prepared concert suites, where the composer has specifically chosen which pieces would go into the program. 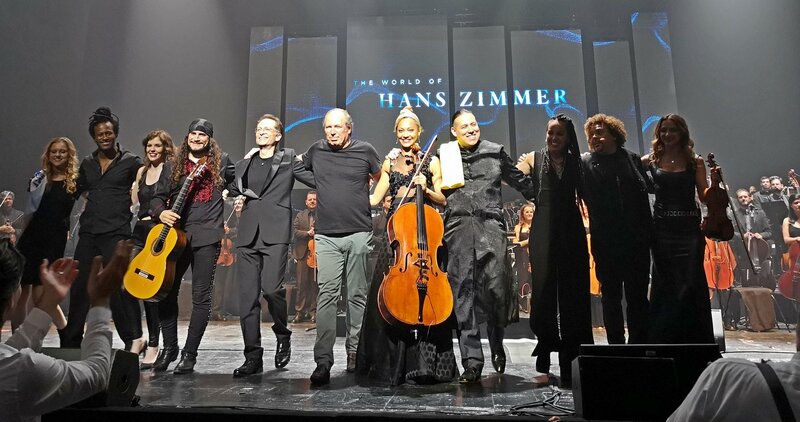 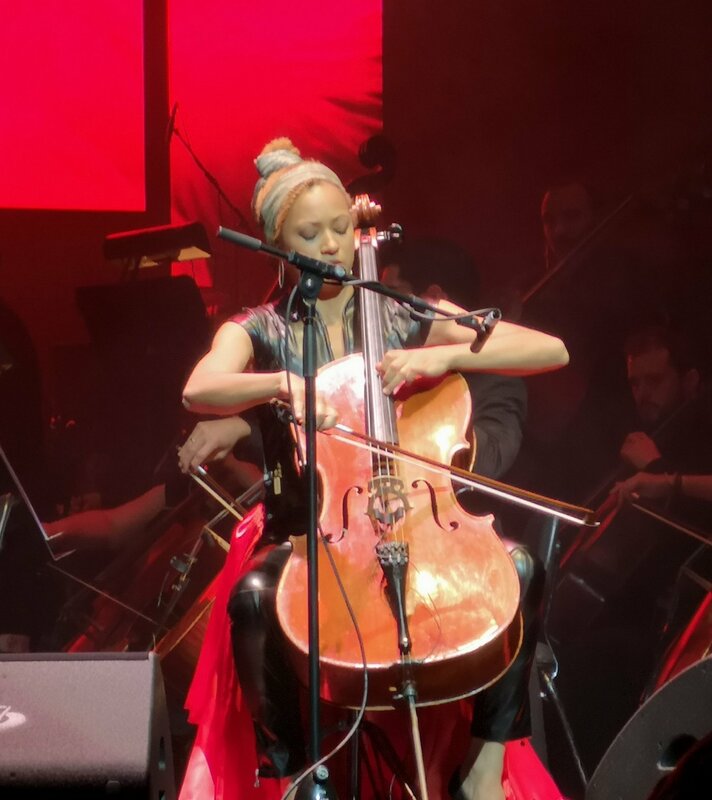 Hans Zimmer has also chosen the majority of musicians and soloists that are part of the show, many of whom have worked with him for years (such as Lisa Gerrard or Pedro Eustache). 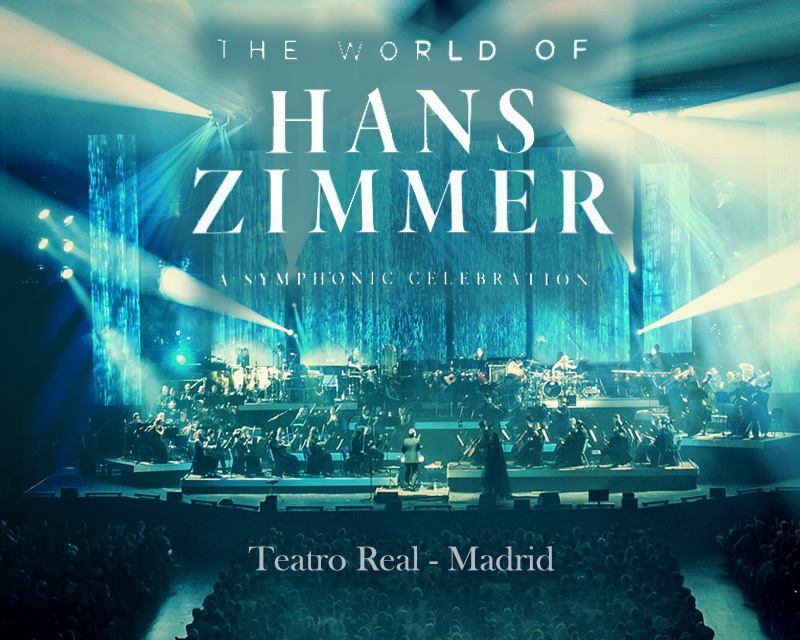 Initially, Zimmer is not part of the show as a musician, although he usually makes special guest appearances in some of the shows, and as we will see later in this article, he was in Madrid at the Teatro Real, and performed a piece at the end of the concert. 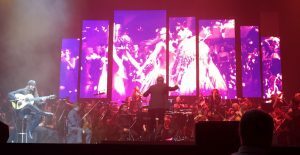 In the technical part, this symphonic show has for the whole tour the participation of the Symphony Orchestra of the Bolshoi Theatre, Belarus and the Belarus Radio and Television Choir, under the baton of Gavin Greenaway, Hans Zimmer‘s personal collaborator for more than 25 years and responsible for many of the recordings of his soundtracks. 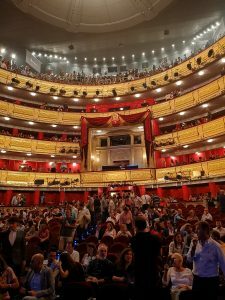 However, it is possible that national orchestras / choirs are used in specific places, as happened for the concert at the Teatro Real. 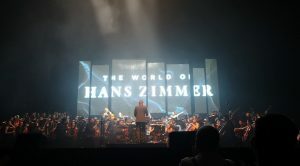 Thus, ‘The World of Hans Zimmer – A Symphonic Celebration’ is an impressive show with more than 100 musicians on stage, showing scenes of his most important films on giant LED screens, having as promoters Semmel Concerts, Tomek Productions and RCI Global, LLC., and sharing creative and technical team with the people who organize the prestigious ‘Hollywood in Vienna’ festival. 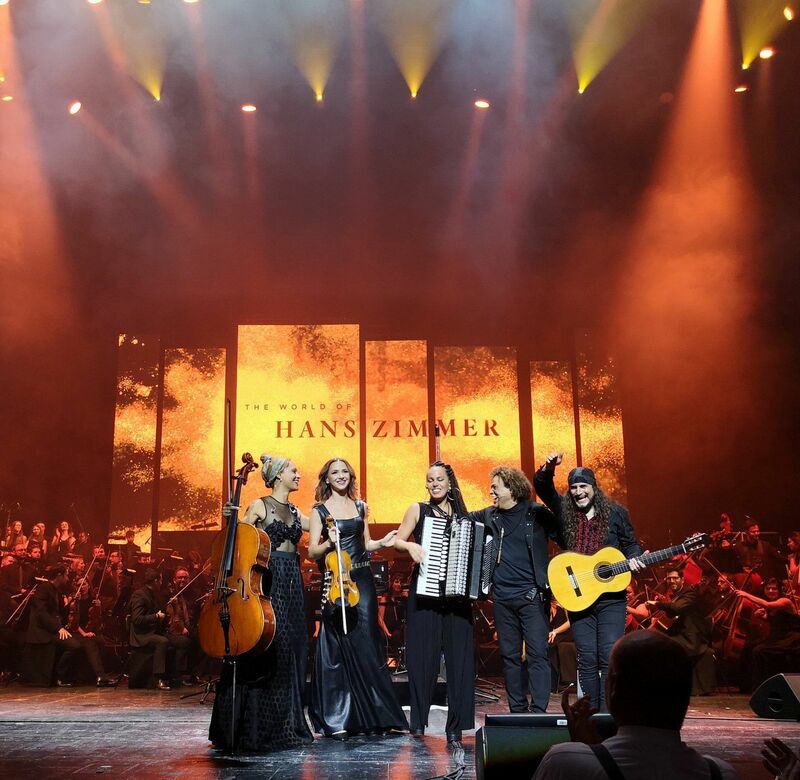 And finally, for all the people who have not been able to attend the show or for those who want to live the experience again, on March 15, 2019 a CD with the music of the show was released; music recorded during the concert held at the Hollywood in Vienna festival 2018 (read news). 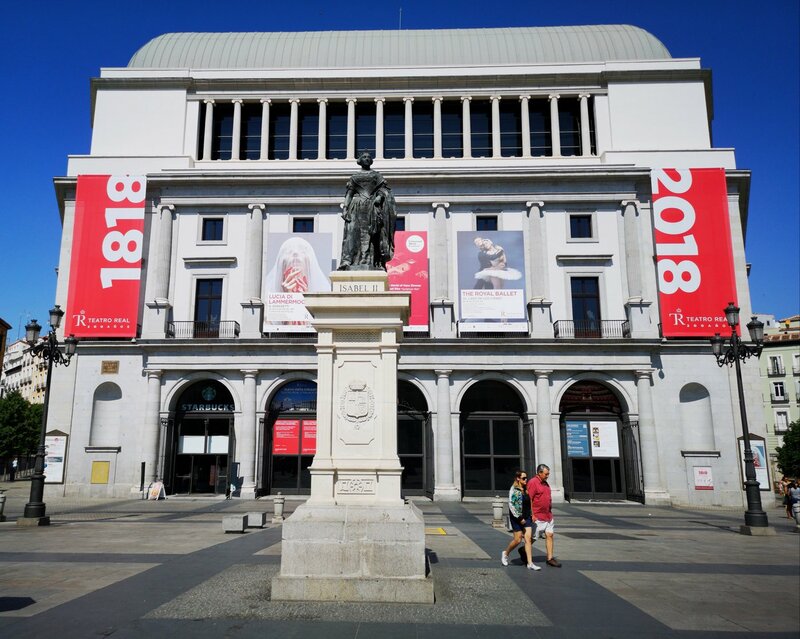 After talking about the show in general, let’s come back to the concert that takes place at the Teatro Real in Madrid on July 3, 2018. 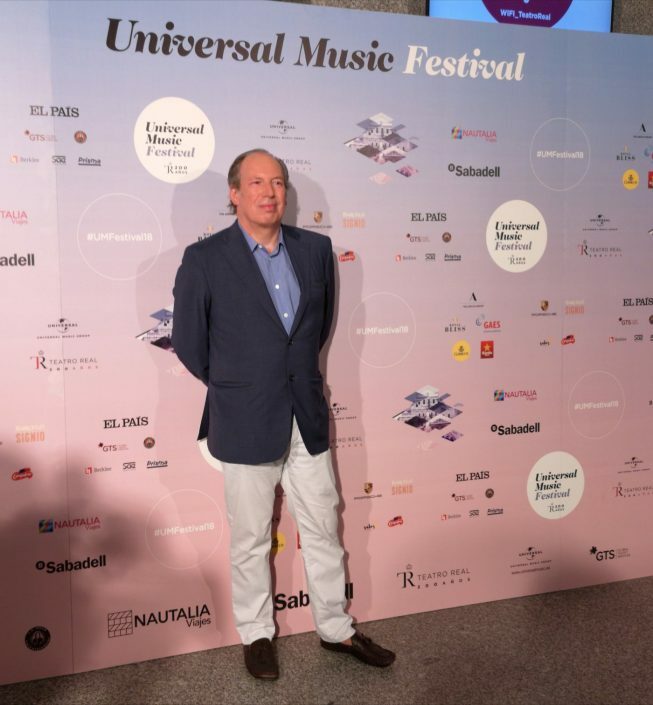 A few days before the concert, it was announced that Hans Zimmer himself was going to be in Madrid for the show, and that he was going to give a press conference that the morning. 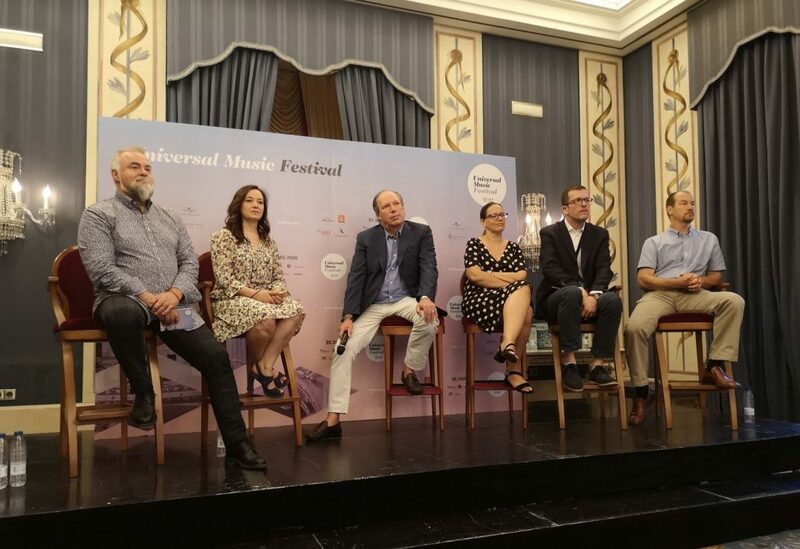 All the biggest national media attended the press conference, something unusual when we’re talking about a film music related concert. 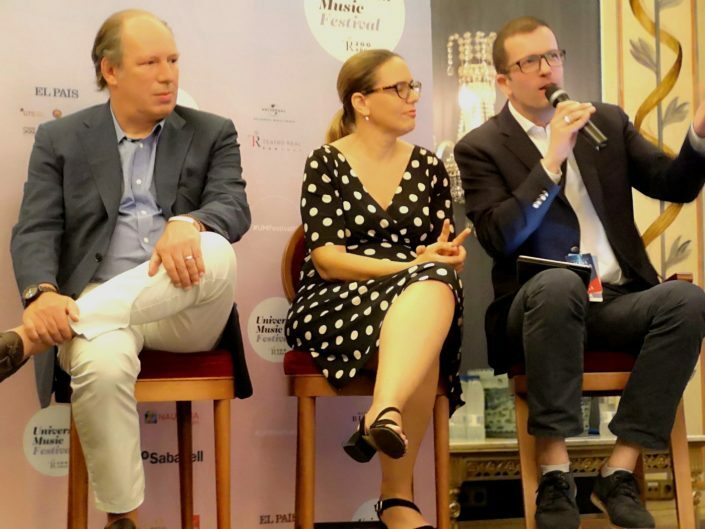 Of course, SoundTrackFest also attended the press conference. Here you have some pictures of those moments. 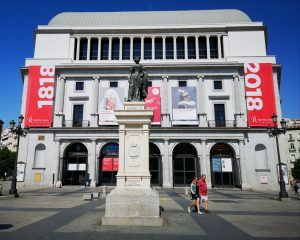 The concert officially begins at 21:30h, but at least an hour before starting, there’s a crowd around the doors of the Teatro Real in Madrid, since the concert is quite an important event in the city. 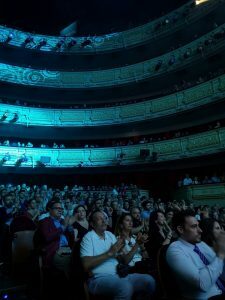 At the entrance of the theater, a photo-call has been placed, where different personalities and celebrities from the world of cinema and music stop for a picture, who come as guests to the concert. 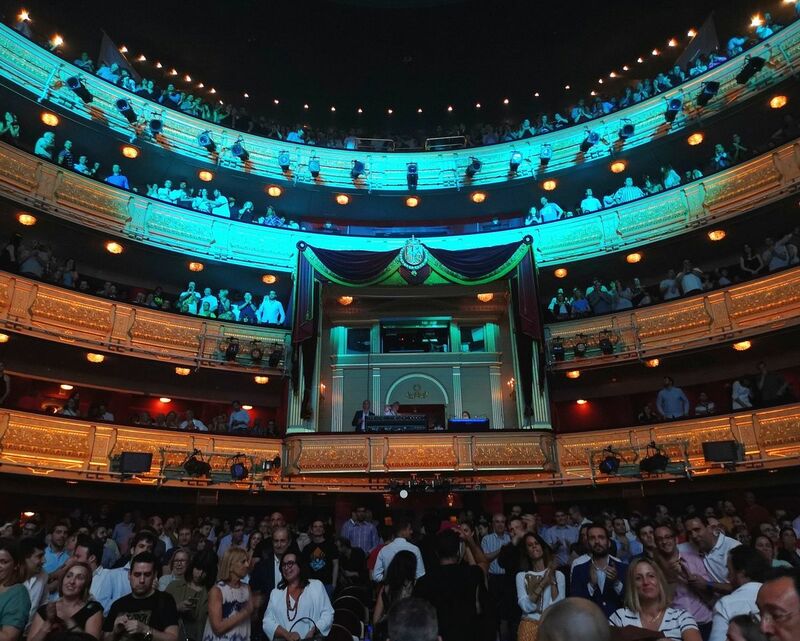 The inside of the Teatro Real, a building with majestic characteristics and a concert hall with capacity for 1750 seats, is full of people, as tickets had been sold out long time ago. 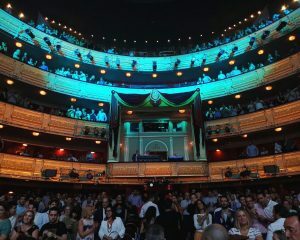 The great interior of the theater receives people little by little and without excessive build-ups, and once inside the main hall, you can see how 4 additional rows have been added to those originally planned, in front of the stage, to accommodate all the guests, personalities, and press that will attend the concert. On the stage, in addition to the usual musical instruments and various elements of an orchestral show, we can see a very interesting visual showcase: a total of 7 huge retro-illuminated LED screens, which will be used to give support and visual reinforcement to the music. 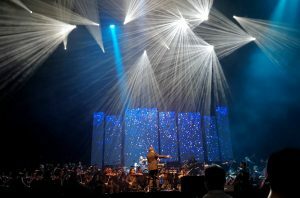 Being this concert of ‘The World of Hans Zimmer – A Symphonic Celebration’ an extraordinary concert in comparison with the rest of the concerts of the tour (it was the only one that did not have any other concerts nearby in dates, since the previous one was on May 7 in Zurich and next one on November 7 in Basel), tonight the orchestra was going to be different from the “official” one, it was going to be the Orquesta Ciudad de Almería conducted by Gavin Greenaway, along with the male and female voices of the choir Coro Sintagma. The cast of musicians that comprise the rest of the tour’s usual team remains unchanged, with the exception of Lisa Gerrard, lead vocalist, who cannot be part of this concert due to its dates, so her parts have to be carried out by rest of the singers. 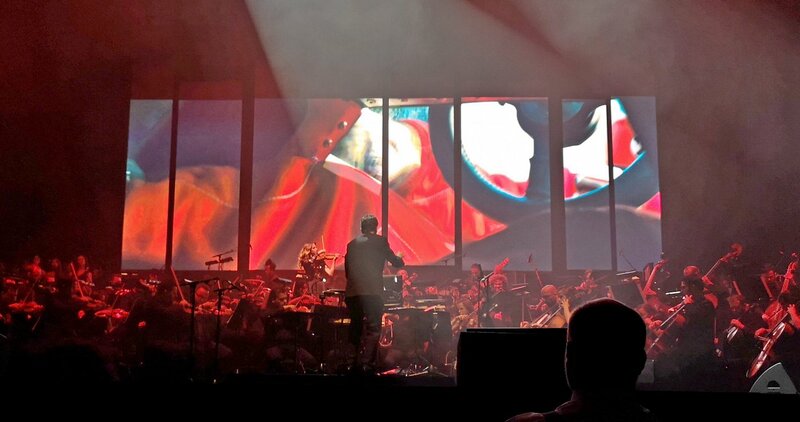 At 21:35h the evening begins with the first piece of the show, The Dark Knight, where we can see all the visual power of the show, through the lights and the images shown in the fabulous 7 high definition LED screens that occupy the entire back of the stage, which have a spectacular image quality and brightness, as I have rarely seen in a concert. The suite begins with strength, with a great presence of the percussion, and with the orchestra offering an intensity that increases, that then adds the female voices of the choir, finishing the theme 7 minutes later with an explosion of light and with the logo of the tour, emulating the presentation of Batman in The dark knight: ‘The World of Hans Zimmer – A Symphonic Celebration’ is here… The show has begun! 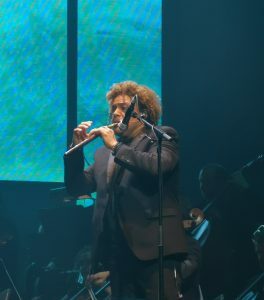 We continue with the next piece of the night, King Arthur, intense and with many nuances and harmonies, where we can start to see the first solo performances, with Pedro Eustache showing his mastery with the flute, and a solo violinist who has moments of prominence, in a piece with strength that is supported by the voices of the choir. 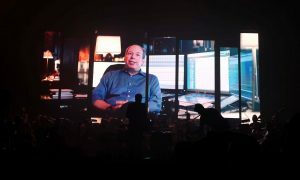 It is almost 21:50h and the screens show a video where Hans Zimmer presents his longtime collaborator and conductor, Gavin Greenaway, also giving a welcome message to the audience in Spanish, and then introduces the next piece that we are going to listen to, the music he composed for Mission: Impossible II, which has a Spanish setting. 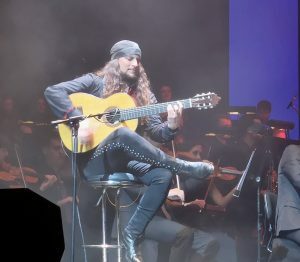 As soon as the suite begins, we can see that the Spanish guitar is going to be the main protagonist, performed by Amir John Haddad – El Amir, who brings out a sparkling sound from the instrument, supported by several of his companions on the stage clapping to accompany him, and also melodically helped by the orchestra. In the final part, the music is enhanced by the voice of the soloist Asja Kadrić, with a light flute played at times by Pedro Eustache. The suite, of almost 10 minutes, offers tension, action, strength, lament, and passion, with images and graphics that amplify all these sensations, in a wonderful audiovisual synchronization. 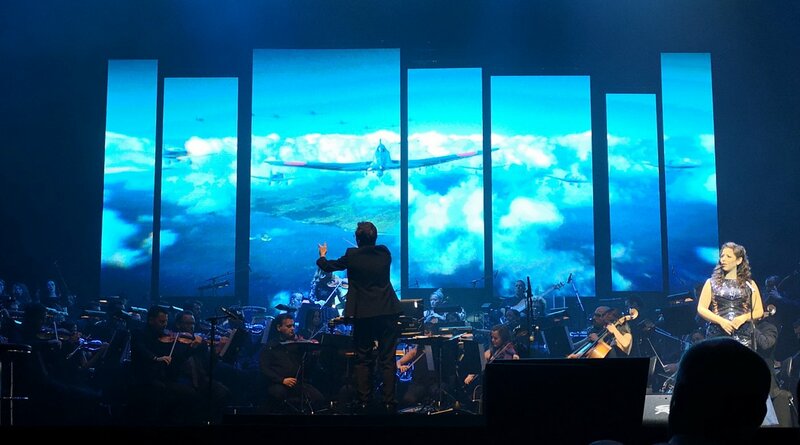 It is 22h and it is the turn of the Pearl Harbor suite, a sweet and harmonious, but at the same time bitter suite, since it represents two worlds in struggle: the love of two people and the harshness of the war and the attack on Pearl Harbor. 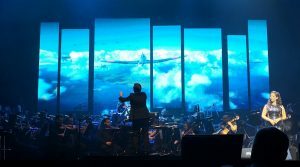 An attack that is cleverly reminded to us by the great images shown on the screens, which depict Japanese planes on their way to destroy the famous American military base, creating moments of great musical tension. 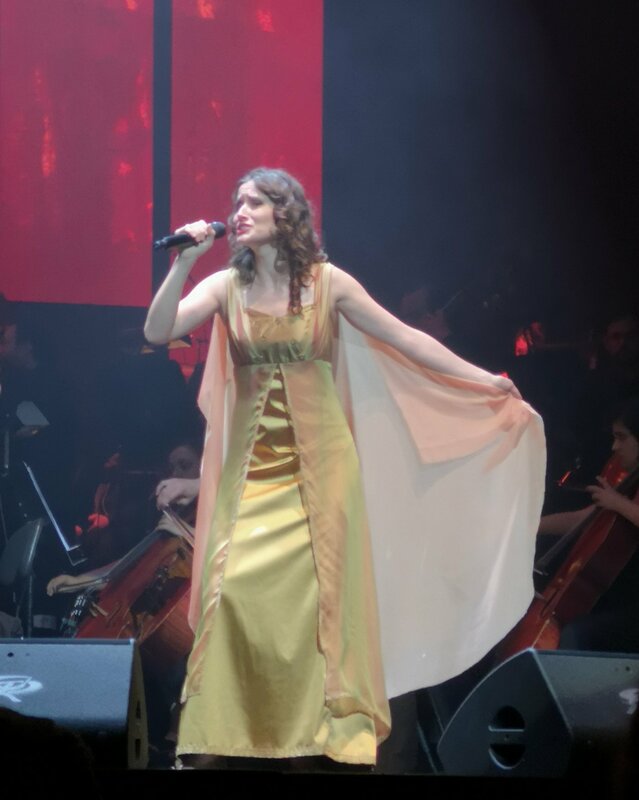 I have to highlight the voice of the soprano Gan-ya Ben-gur Akselrod when she performs the main melody, almost at the end of the suite, giving us goosebumps. 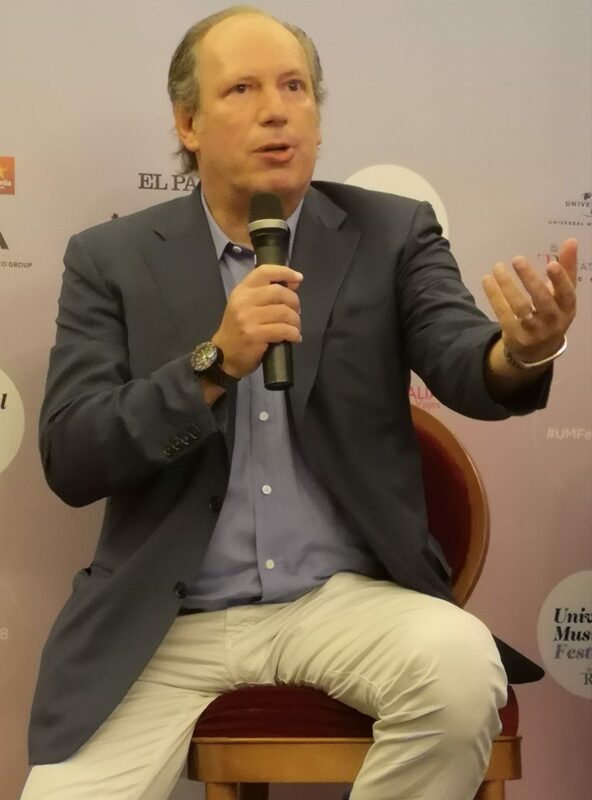 Next we can see a video of film director Ron Howard and Hans Zimmer chatting in Zimmer‘s studio and presenting the next piece, Rush, a racing movie that tells us about the rivalry between Formula 1 pilots James Hunt and Niki Lauda. 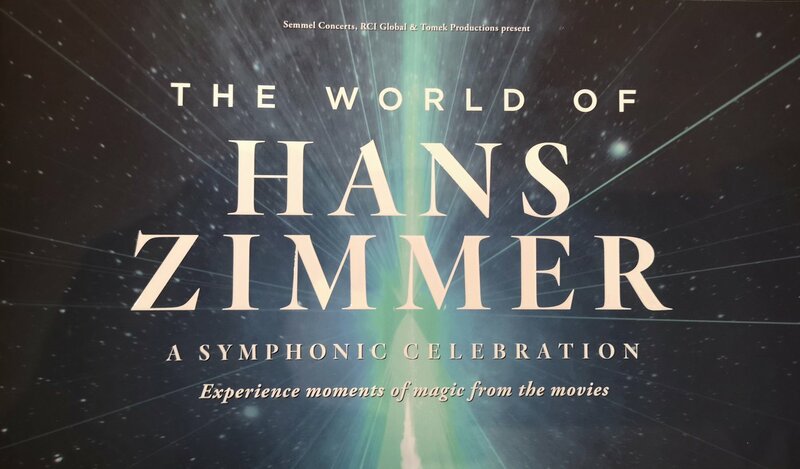 Ron says that initially he did not know very well what kind of music he wanted to put in the film, and that his initial conversations with Hans were very important, since by doing tests in his studio, they managed to establish the sound that the film should have. Very interesting videos the ones shown before some of the suites, to explain what we are going to listen to next. 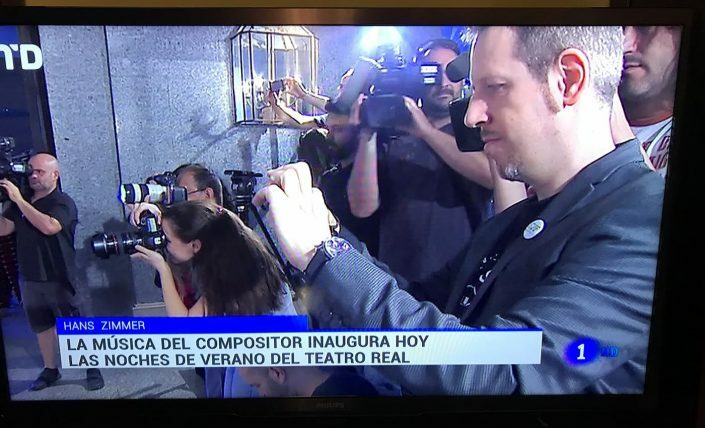 As an improvement, indicate that all these videos were in English without any subtitles in Spanish or English, being the subtitles something that could have facilitated their understanding to the general public. The suite from Rush begins soft, with violins that are accompanied by the French horns, and with a theme that goes growing in intensity to suddenly appear the electric guitars, first softly in the background and then gradually moving to the foreground. 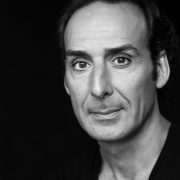 A perfect balance of sound, with a lot of energy and power, to depict the tension and speed of the race, which is beautifully accompanied by descriptive images, which add adrenaline until the moment of the accident, in which everything relaxes, and the music is gradually reduced in intensity at the end of the suite. 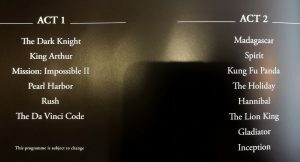 Now we have a video in which the protagonist is again Ron Howard, as he makes the introduction of another of his films, The Da Vinci Code. Hans Zimmer indicates that the piece we are going to listen to does not appear “as is” in the film, but it is part of his sketchbook. 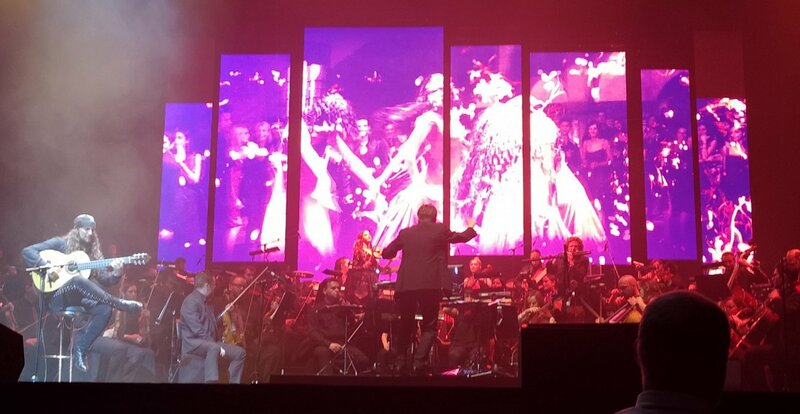 The suite begins with the voices of the boys of the choir and the voice of the soprano Gan-ya Ben-gur Akselrod, who is dressed in a black cape and hood, singing in a very operatic style, offering an ecclesiastical sound, while the images that are shown on the screens, are gradually building the shape of a cathedral. 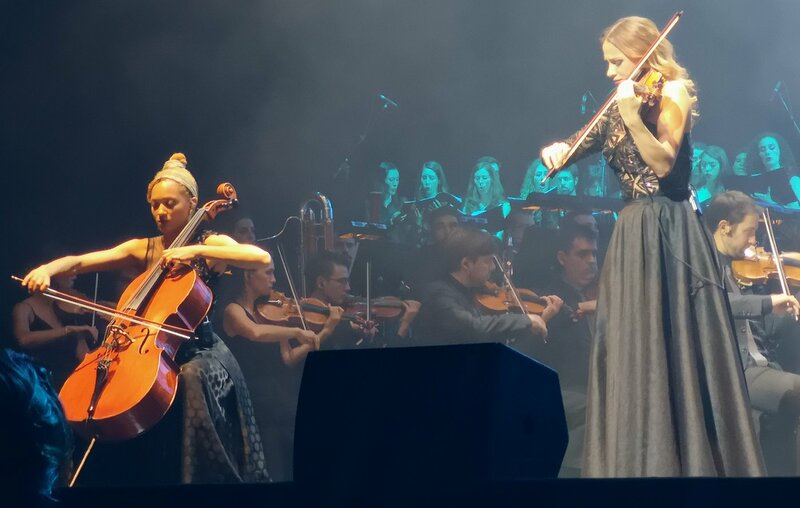 The piece moves between the intensity and a calm religious tone, where the choir predominates at all times, and then the violinist Rusanda Panfili and the cellist Marie Spaemann take the center of the stage, when the main theme known by everyone from The Da Vinci Code starts. A duo that complements perfectly each other, and that alternates between one instrument and another, while the tone of the piece increases until the final climax, both musical and visual. 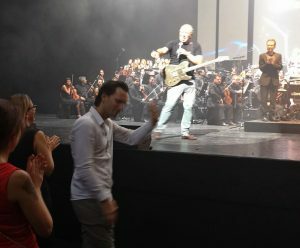 A great suite of almost 15 minutes, with two very different parts, which takes us to the intermission at 22:35h, an hour after the beginning. 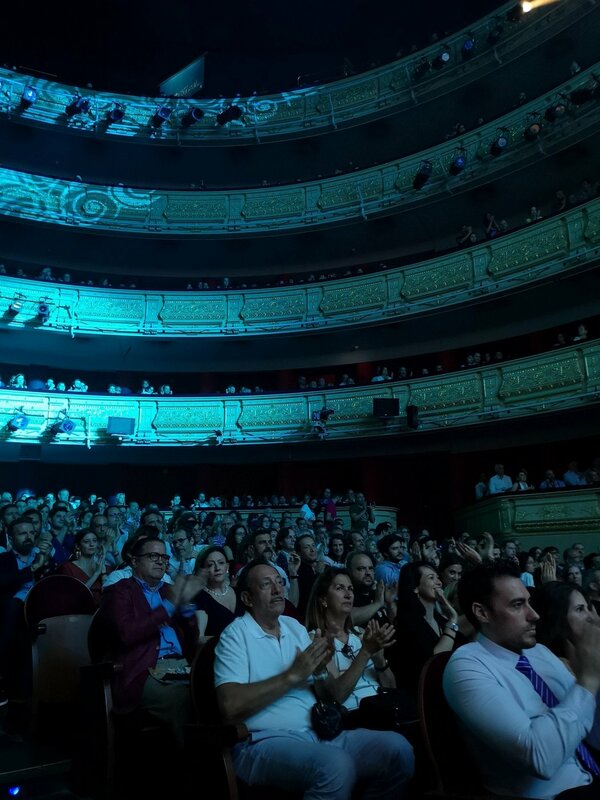 But before going to the intermission, there is a great round of intense and continuous applause from an enthusiastic audience, both for the musical quality and for the visual quality of what we have seen in this first hour of concert. 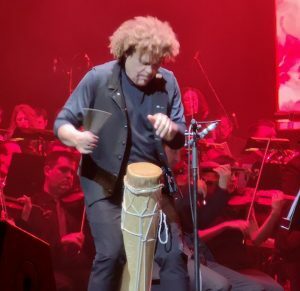 After a brief break of 20 minutes, the second part starts almost at 23:00h, with a short 3-minute piece dedicated to the movie Madagascar, where the ukulele and a high-pitched flute played by Pedro Eustache predominate, in a funny theme marked with humor. 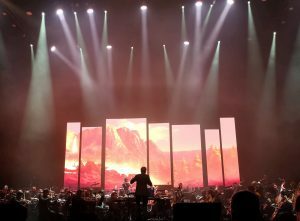 Then, and almost without pause, comes the wonderful suite of Spirit – Stallion of the Cimarron, which starts off softly and gathers energy, having a very important visual reinforcement in the images and videos of the screens. 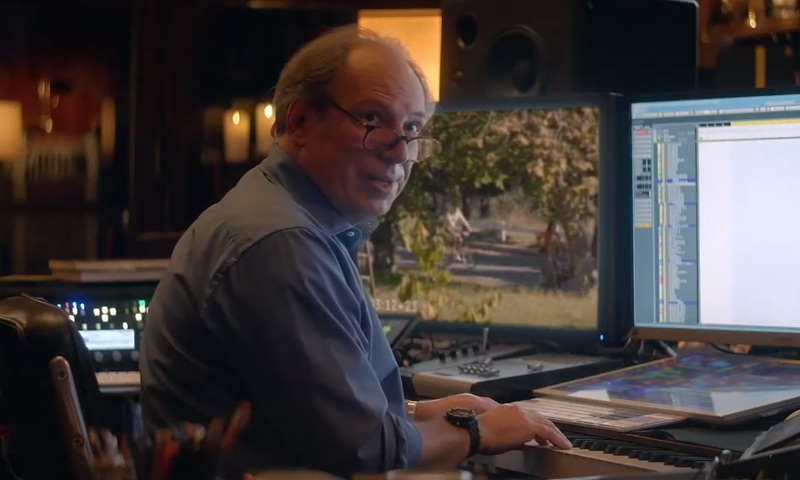 Following, we are shown a new video with Hans Zimmer talking about Kung Fu Panda, where a music of marked oriental character transports us to the troubles of a funny and fatty Kung-Fu fighting panda, where the special sounds that Pedro Eustache gets from the various flutes he uses are incredible, being the main flute the same one he used when recording the original soundtrack of the film. A true virtuoso! The following video has the film director Nancy Meyers, who presents the music that Hans Zimmer composed for the movie The Holiday. A theme that begins with a soft piano followed by the sound of the strings section, offering a melancholy tone, and then having a change to bring some hope and encouragement, incorporating at the end the guitar to the melody, and finishing with a Rock version of the main theme. 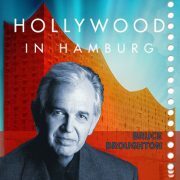 An 8-minute long suite, very good and very interesting. 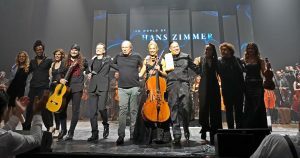 Hans Zimmer presents the music of Hannibal in a new video, where he tells us that in counterpoint to the darkness and rawness of the film, the theme we are going to listen to is a love theme, and we can sense that when on the right side of the stage appears the cellist Marie Spaemann, to perform the piece in a subtle, delicate, and almost accomplice way, with the accompaniment of the choir. 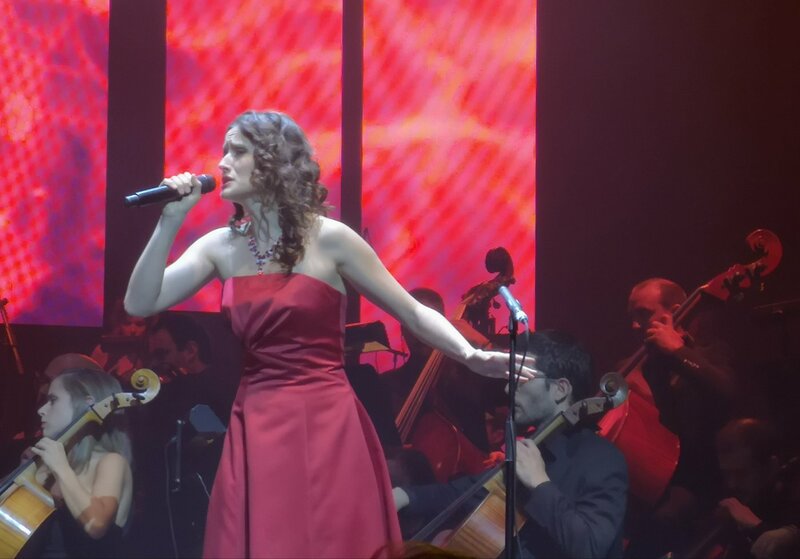 A very intimate and delicious love theme, that lasts almost 8 minutes. A new video makes the introduction of the next piece, and in this case Hans Zimmer has the South African singer Lebo M in his studio, with whom he collaborated closely in the score of The Lion King, where both tell us the difficulties they had to get the African choirs that appear in the soundtrack, and that together with the voice of Lebo M, contribute to the characteristic sound of the music. 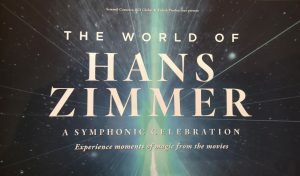 Zimmer also reveals us as that in a certain way, the music represents a Requiem to his deceased father, in the same way that the music is a requiem to the father of the young Simba, who has to deal with that loss throughout the film. 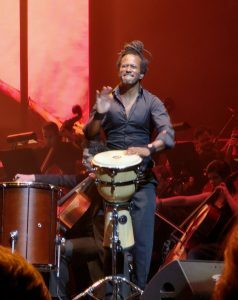 The music starts and we enjoy nearly 10 minutes of a wonderful suite of The Lion King, the music that gave the Oscar to Hans Zimmer in 1995, where the whole orchestra and the solo musicians give all their best, both in the percussion section with soloist Luis Ribeiro appearing on the front line of the stage, as well as with Pedro Eustache playing African drums and flutes. 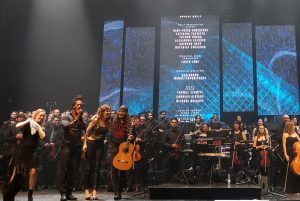 All this is accompanied by a powerful choir, to deliver the rhythm, commitment, passion, and intensity, of a music that grows until it ends with the theme “The Circle of Life”, that although in the film serves to start the story with energy, here is used to finish the suite in a musical apotheosis. Awesome!! 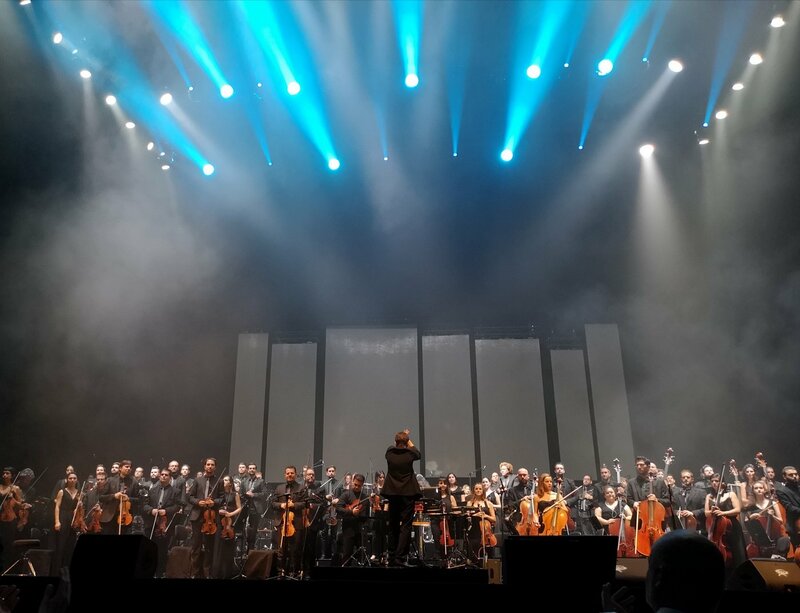 It’s 23:45h and although there is not much time left to finish the concert, there are still some magnificent pieces waiting, like the one that comes next: Gladiator, where the voice of the singer Asja Kadrić replaces the original singer Lisa Gerrard, that could not be in Madrid. An emblematic music, which has been used on countless occasions outside the movie, both in television programs and trailers, and which is offered to us in a wonderful concert version of almost 15 minutes, where different moments of the soundtrack are included, perfectly stitched in the suite. Hans Zimmer appears again in a video, the last one according to the official program, to present first the soundtrack of Inception, and then to play its first notes with the piano in the video, being next accompanied by the sound the orchestra. And since it’s already 12 o’clock, a somehow bewitched and enchanted hour, a peculiar hour of the day linked to magic… as if it were a question of magic, Hans Zimmer appears on the right side of the stage!! 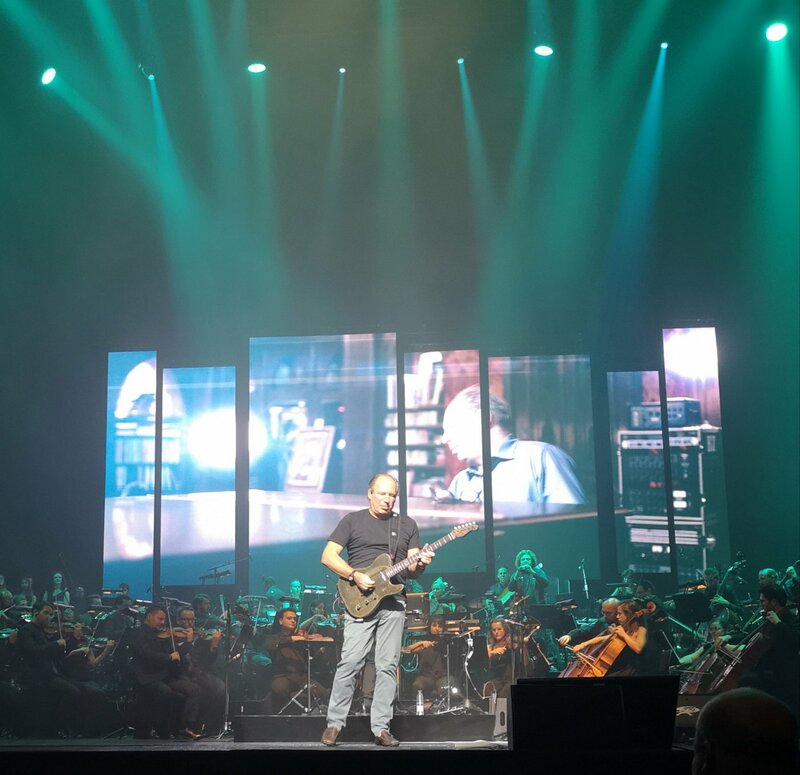 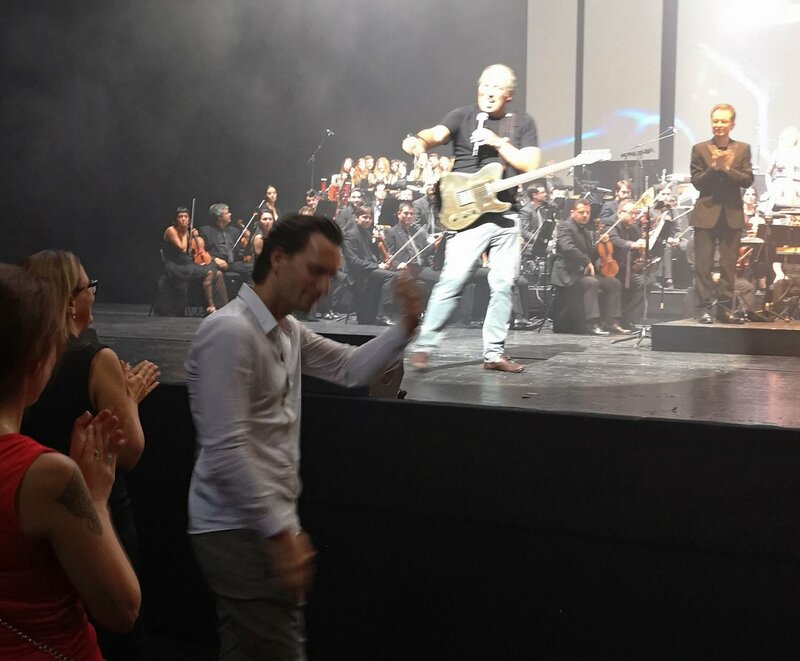 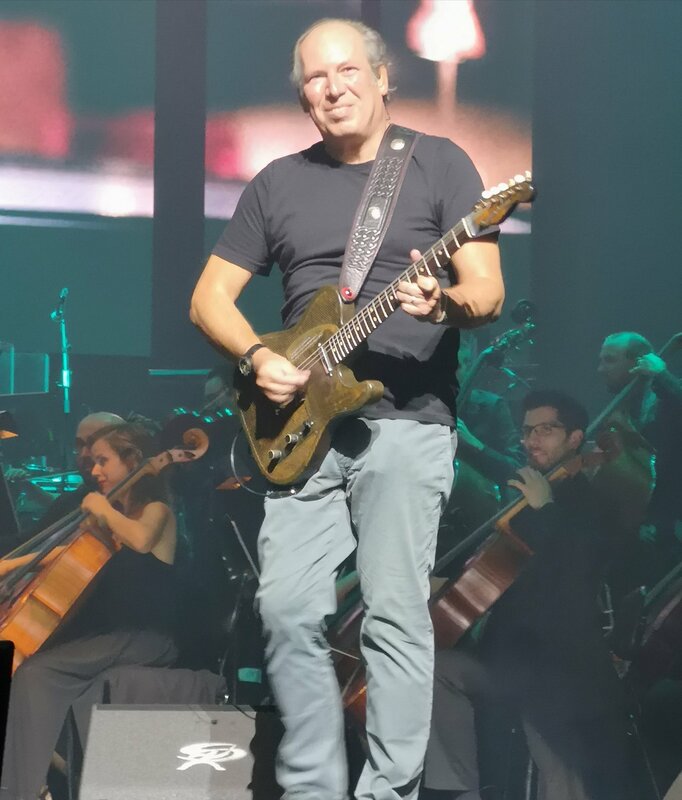 Zimmer plays the guitar live at the Teatro Real, complementing the ‘virtual Hans Zimmer of the video’ that plays the piano, and thus becoming part of the piece, to the amazement of the entire audience, who applauds and shouts enthusiastically. 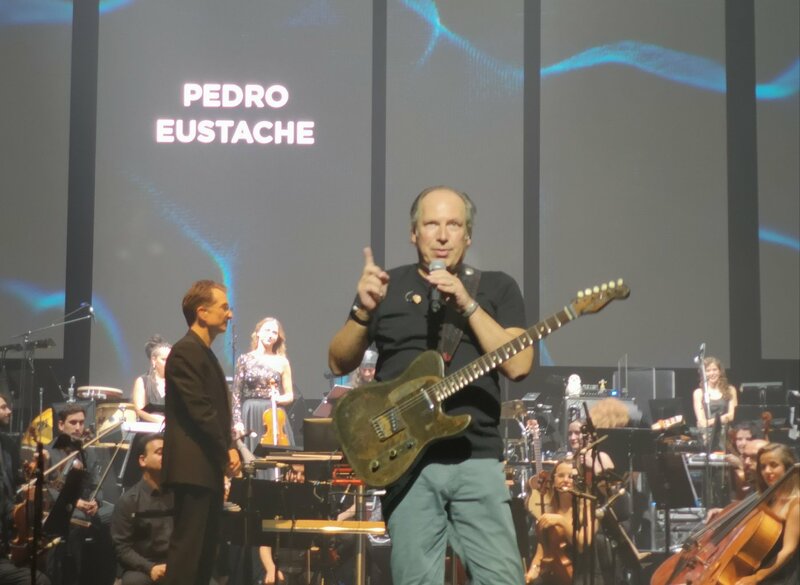 Finished the suite and with a standing audience that applauds and cheers the composer’s presence, as well as the quality of the concert, Hans Zimmer thanks the audience and the musicians (conductor, orchestra, soloists and choir) for such a special evening, and also thanks the great welcome received in Madrid. 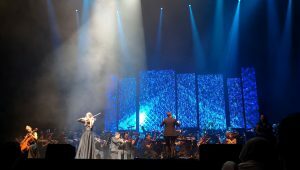 And so, when it is almost 00:15h, we go to the first and only encore of the concert, the music of Pirates of the Caribbean, reinforced with images of spectacular naval battles, where many of the soloists come out to the front of the stage, to add all the strength of their instruments to the combination of the orchestra (Marie Spaemann – cello, Rusanda Panfili – violin, Eliane Correa – accordion, Pedro Eustache – flute and Amir John Haddad – El Amir – guitar). 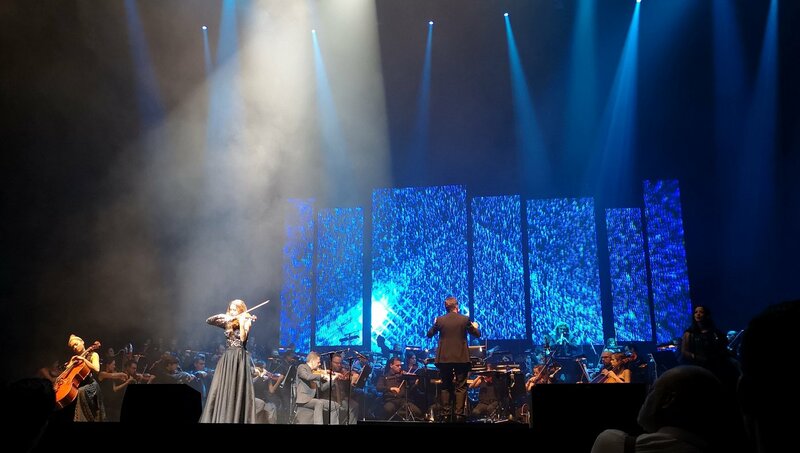 A great ending of the suite and a great end of the night!! 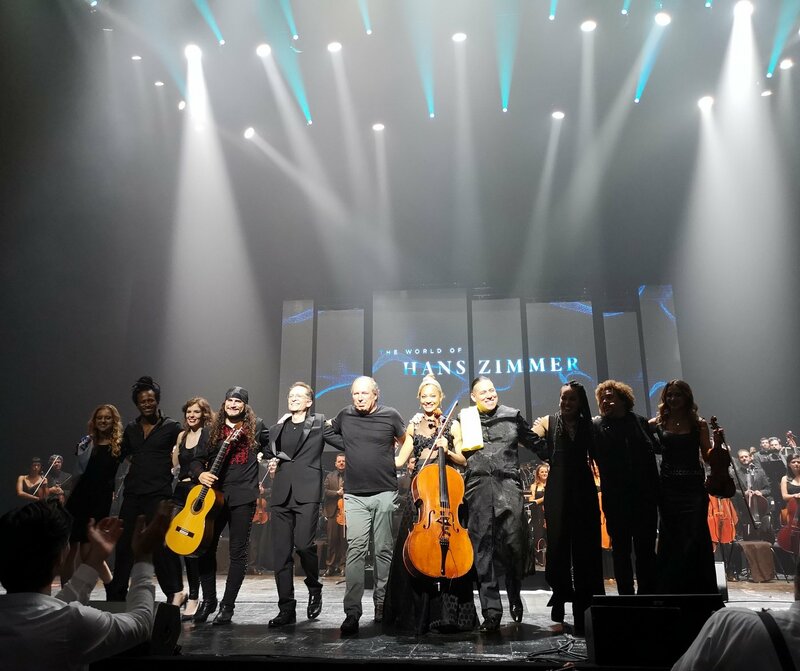 The concert is over and one by one all the musicians and solo singers come out on stage to form a large line, to be followed by Hans Zimmer, who stands next to his friend and conductor Gavin Greenaway. 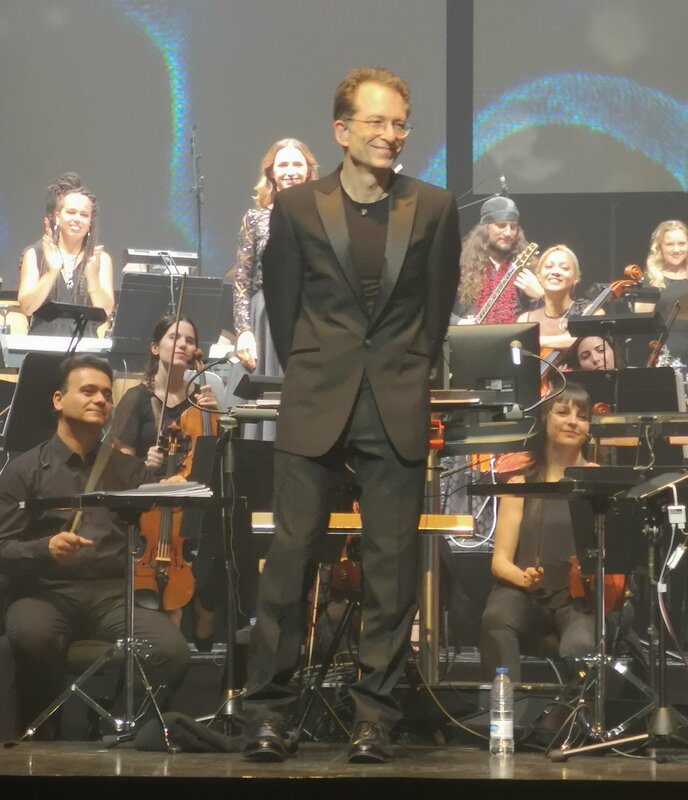 The conductor has done a great job tonight keeping the rhythm and the tempo, in perfect audiovisual synchrony, with a great performance of the Orquesta Ciudad de Almería along with the choir Coro Sintagma, receiving all of them a massive applause from a standing audience. 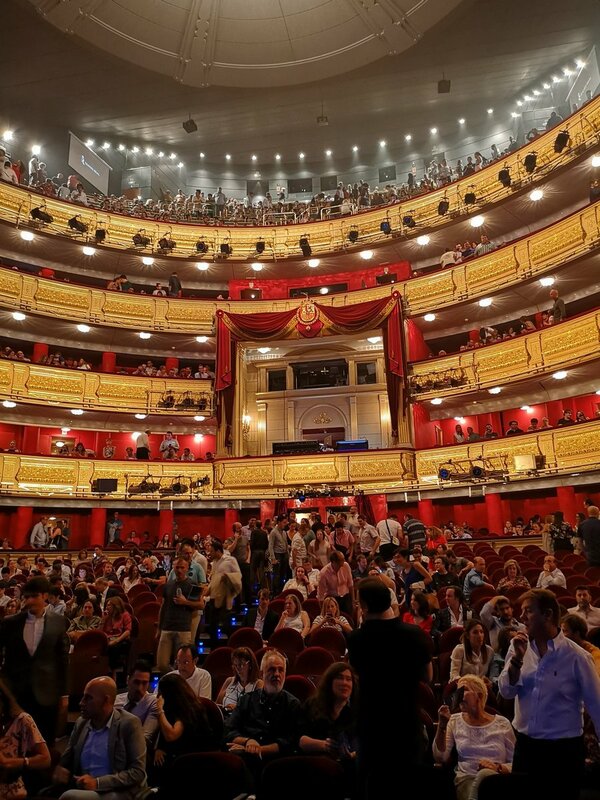 It’s 00:30h and a great concert ends here, almost 3 hours after starting, in a crowded Teatro Real, where we have been able to enjoy a wonderful show in both the music and the visual sides. 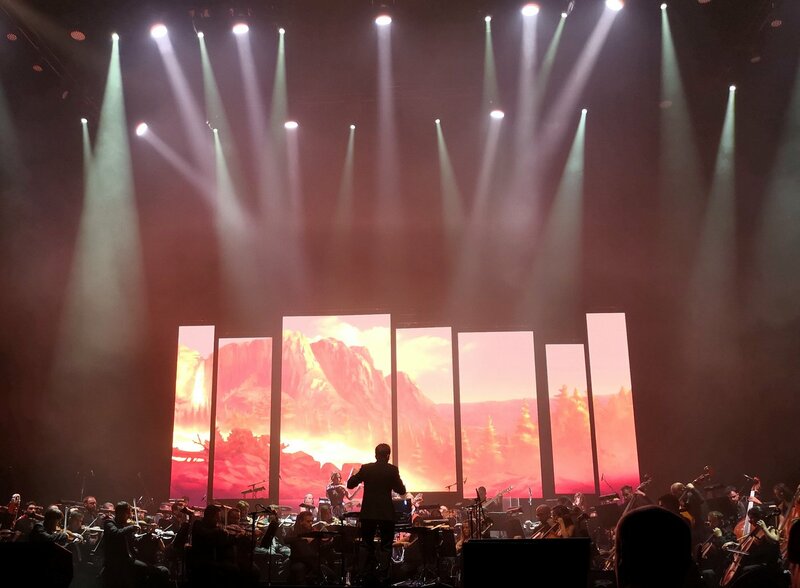 I have to highlight the spectacular visual design and graphic work that the concert has, where without distracting excessively from the music but providing additional information, visuals give a new dimension to what we can hear. 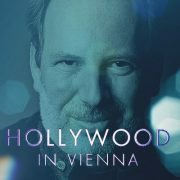 Great work by Michael Balgavy and all his team, already known for being part of the prestigious Hollywood in Vienna festival. 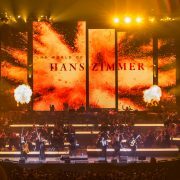 The World of Hans Zimmer – A Symphonic Celebration is a fabulous visual and musical show, centered on the work and figure of Hans Zimmer, with a meticulously chosen and well-balanced program, with carefully arranged orchestral arrangements and adaptations, and with visuals effects that wonderfully accompany the music we are listening to. 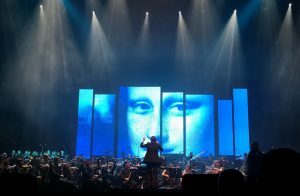 The visual design is one of the best designs I’ve seen in a concert, presented in hi-quality LED screens, with a resolution and sharpness as you can rarely find in a concert. 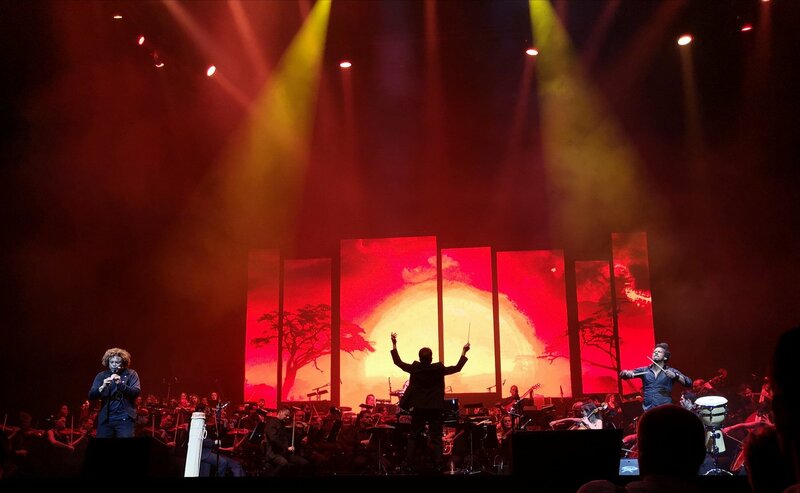 And finally, special mention to solo musicians, masters in their instruments, who know the scores by heart, and who, together with the orchestra perfectly conducted by Gavin Greenaway, offered a spectacular concert. 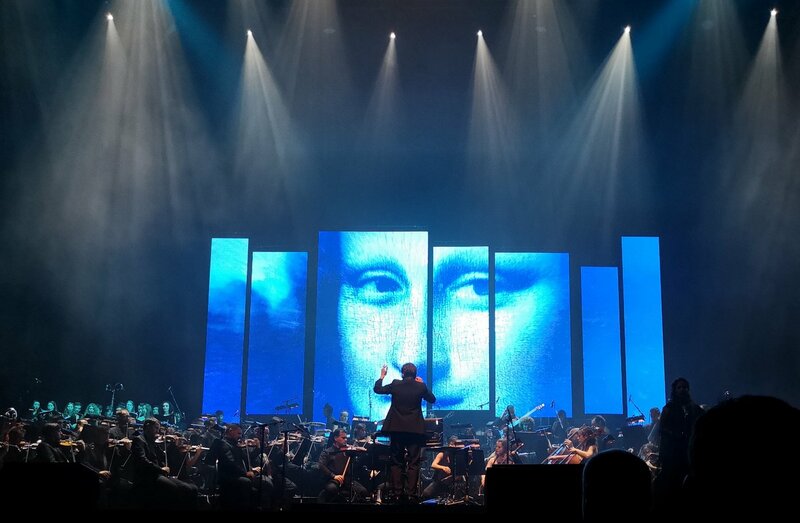 An unbeatable audiovisual experience! 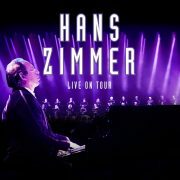 If you are a fan of Hans Zimmer’s music, run and buy a ticket for any of the concerts of this tour. 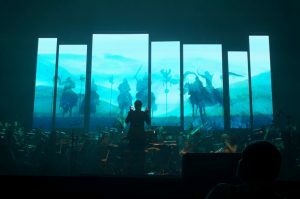 But if you’re not a fan or you’re not sure if you should attend, and this tour passes close to you, do not think twice… Go and watch it! 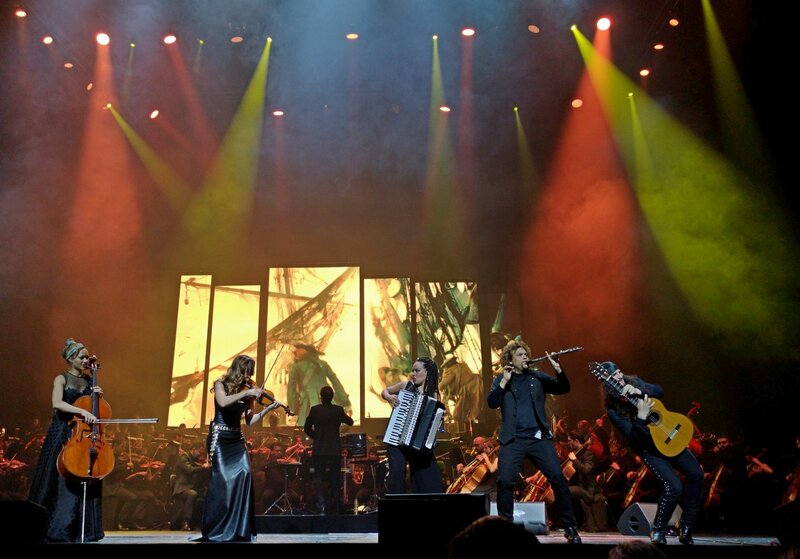 You will enjoy an experience that you will remember for a long long time!